Leeds Castle in England is known for the title, Castle of the ladies. This is because the entire six queens of England inhabited the incredible halls which are beyond impressive. The walls of the palace are built with the most elegant stone. Quite immodestly, but this castle is still considered that the British deserved this palace for the most beautiful castle in world. Not surprisingly, it has been determined by the "Travel Channel" the most beautiful and picturesque old building on the planet. The castle dates from the mid-800 and served as the home of Edward I, Henry V and Henry VIII. Spectacular is that the two small islands are joined by a lake, which surrounds almost the entire picturesque building, Leeds kept their ornate halls of the immense wealth of art and antiques of which each tells its own story. The foundations of the palace were laid in 857 by Etelbart IV, a member of the Saxon royal family. For several centuries the castle was an impregnable stone fortress. 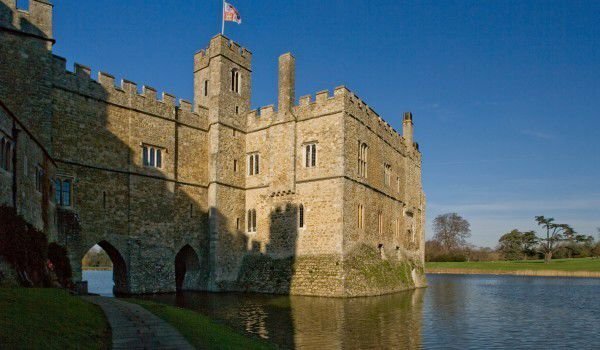 From 1278 the castle became a place to live for royalties and was occupied first by Edward I. Leeds Castle fell into the hands of the army of King Edward II in 1321 because of his wife Queen Isabella was denied. Since then, Leeds Castle was his no more since he wore the glory of a building inhabited mostly by women. Leeds Castle is a unique exhibition of ancient dog leashes, which are displayed in the museum. In addition to the palace, old paintings, hand-embroidered tapestries and antique furniture are all beautifully arranged. The whole palace is surrounded by the incredibly beautiful gardens, plant mazes, vineyards and even a golf course. The house, built in the garden of the castle has a magnificent view of the lake and is home to an amazing variety of birds, including colorful parrots. However, one of the most interesting activities at Leeds Castle for those who decide to spend the night in the old fortress, is the dinner. Dinner is served at the banquet hall named "Henry VIII" which has a preserved medieval atmosphere and charm.